345029, 345020, 345023 photographed on the first day of operations on March 1, 2018. 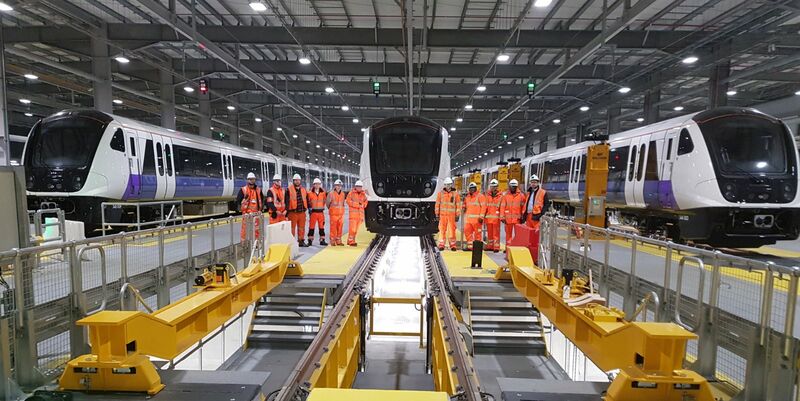 TfL Rail and Bombardier have launched operations at the new Elizabeth line depot at Old Oak Common. Thirty staff are currently based at the depot, supporting the line’s testing programme. The number of staff will increase to around 80 in the summer as more trains are delivered and MTR Crossrail gears up for the official launch of the Elizabeth line in December. Built by Taylor Woodrow, the £142 million facility includes a main depot building and nine maintenance roads. The site is powered by a hybrid renewables energy system (HRES), which utilises solar energy from photovoltaic (PV) cells and a solar water heating system. Bombardier has built 35 Class 345s to date including two nine-car trains, which are undergoing compatibility testing between Maidenhead and Paddington and CBTC testing in the central section. The first new Elizabeth line Aventra travelled through the central tunnels for the first time on February 25. The train was driven from Abbey Wood in South East London under the Thames towards the Connaught Tunnel and back again.